Etiquette is a tricky subject. There are things every blogger is kind of expected to know, but there really isn't a lot of information out there to make sure we know it. A lot of these things are things I wondered and worried about as a new blogger, or mistakes I have personally made. This is mostly just my own opinion and experiences, and I'm certain I'm not covering every blog etiquette concern there is, so when in doubt let's just do onto other bloggers as we would have them do unto us. That simplifies things a little, doesn't it? I'm sure you're all already doing this one. If you are sharing anything at all that did not originate from you, link to the person who created it. It is good practice even to link to people who inspired your blog post or project. DO link to any instructions, tutorials or recipes you used in a project you are blogging about. An exception would be if there is a particular trend out there that your post is a response to. For example, if you make something out of a shipping pallet tomorrow and blog about it, you don't need to link to every hey, look what I made out of a pallet tutorial you've seen in the last year and a half. But if you see a tutorial for a pallet sofa, follow the tutorial and make your own with a few small changes, you should link to the blogger who's tutorial inspired you. #2. Give traffic where traffic is due. This one is a bit trickier. Let's say you find a coffee cake recipe on Pinterest and try it and love it. Sharing the actual recipe on your blog (even in your own words) with a link to the original site at the bottom of the post would not be ideal. Your reader has no real reason to click over to the original recipe. They've got the information they need, and they don't need to visit the blogger who created it. A better solution would be show sumptuous pictures of the cake you baked, describe how great it was, show adorable photos of your kids with cake on their faces and then link to the original recipe so that your readers have to click through and give the recipe's creator the pageview he or she has earned. DO encourage your readers to check out the links you've shared. DON'T give away so much information that they don't need to click the link. #3.So...Do you have to ask before using an image or some text from another blog? The short answer is yes. Their words and photos are their property. Using them without permission is copyright infringement. However, many bloggers have a blurb on their site stating their sharing policy. You can see mine (at time of this writing) at the very bottom of my blog on the right hand side. Also, to complicate the matter, it has been generally accepted that it is okay to "feature" another blogger's project or tutorial on your blog, or do a "round-up" post where you link to a variety of projects or ideas on a single theme. For example a blogger might do a list of "10 Awesome Valentine's Day Crafts" in which they show images of 10 crafts made by other bloggers and under each photo give a short description and a link to the original tutorial. Bloggers do this all the time,and they don't ask for the use of the photo because featured bloggers are often thrilled by the extra traffic the feature brings. It is generally considered an acceptable practice. One concern is that with the rise of Pinterest, that photo is now going to end up floating around the web linked to the person who did the round-up post instead of the person who created it. To some bloggers this might not be an issue because that Pinterest pin still eventually leads to their blog. But I think you can probably see why it's a tricky situation. Use your best judgement. And when in doubt, ask. Most bloggers will jump up and down at the thought of more incoming links. #4. Link to the blog, not the pin. Personally, I feel that instead of linking to a specific pin on pinterest, it is better to link to the original post that contains the content we want our readers to see. I'm going to show you an example with a Pin that I've pinned from my own blog. "I was browsing around pinterest the other day and saw this great tutorial." "I was browsing around pinterest the other day and it lead me to this great tutorial." The difference is that in the first example the reader may click over to the pin, get the gist from the picture, and the person who created the image never gets the pageview. Since for many bloggers more pageviews = more money (and, for all bloggers more pageviews = great excitement!) I think it's best to link directly to the content we consider valuable. #5. Be careful about Hotlinking. Hotlinking is displaying an image that is hosted on another blog instead of saving the image to your own computer and uploading it yourself. The difference is that hotlinked images draw on the original website's bandwidth (which is a problem if that site pays specifically for their bandwidth) and slows down the original blog when your site is being loaded. I know this post only touches on a few points. 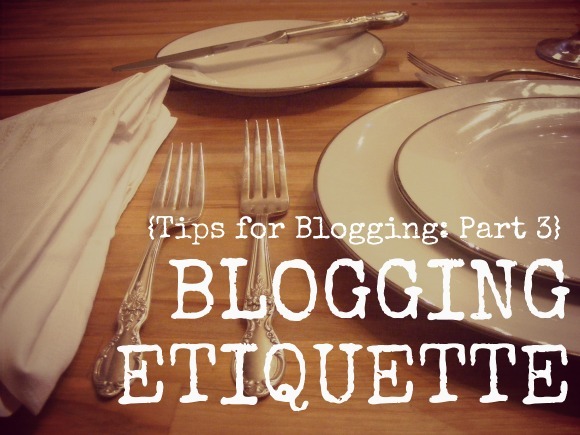 If you have any questions about blogging etiquette that I didn't cover, please ask them in the comments below and we can all debate and discuss it and maybe come to a conclusion. As always, I am so glad you took the time to visit The Complete Guide to Imperfect Homemaking! Great tips! I especially like your suggestion to link directly to a specific post instead of a pin. I'm always careful about credit, but you're right - this is a much better way to handle it. Thanks for all of your hard work. I'm enjoying this series! Oh yes, linking back and giving credit is highly appreciated, what a lot of people don't always realise is that blogs DO fall under copyright laws, just because the author might not be a superstar doesn't mean they can't be protected by copyrights, and the absence of a "c" symbol doesn't mean the site isn't copyrighted, so no stealing material without giving credit. Sites that provide royalty free pictures state it but even then a link back to them is still appreciated. In all my years of blogging I came across one case of people taking my picture to illustrate a review on another site and I got wind of it. I got mad, it was a picture of a packaged cup cake from a store taken in my kitchen, and that person just used that pic to write a review about the cake. I commented on teh review letting them know that while I appreciate their liking my picture they could have at least given me credit for it, I don't mind people sharing my pics, but please give a little love and tell everybody where you found it! Fortunately the person appologized immediately for the blunder. I was told by a lawyer that it's better to hot link than to save someone else's image and upload to host the image yourself. Having permission to use the photo might fix that. Hi. I've only been blogging since October. I've enjoyed your blogging posts so far and have pinned them. Could you tell us how to actually put a link in to other blogs and photos. I've tried to Google this topic, but the answers read like a foreign language to me. Hi Funjani. Are you asking how to create a link? If so, all you have to do is highlight the text you would like to make the link and then click the "link" button at the top of your blog post editor. The text you highlighted will already be in the "text to display box" so you just need to enter the website address of the site you want to link to in the "To what URL should this link go?" box. I hope that helps. I'm not sure which part was sounding foreign to you, so if you're still confused send me an email and I'll try to explain it better. (you can find my email address on my About Me page!) Good Luck! Love your blog and this series -- thank you so much! I've been anxiously awaiting each new installment. Love your Content Policy, too. May I copy that? JK... ;) Love your work! This is a great article. If I didn't like your blog so much, yet, I would now. Thanks a lot. Kelly, thanks so much for all the tips!! I've been following the whole series and have really enjoyed it. Although I've been blogging for over a year I still feel like a "rookie" so the more help i can get, the better. haha. I'd love it if you'd stop by for a visit. I just entered the blogging world in March, and there is SO much to learn! So far I haven't tried to link to other people's blogs or use their photos. I have a gazillion of my own - how do I make sure they stay my own? Do I put some sort of statement on my blogs about using them? Some of them I put the name of my blog across because I'd seen that done on some other sites to protect their photos. I appreciate your good info here - now I'm going to read the other two in this series, since I didn't yet. so I realize this is a rather obscure blogging etiquette question...but if you participate in linky parties, is it bad form to submit the same post to several of them?